(Huffington Post) By Martin Garbus. President Richard Nixon, in 1971, made the same claim as President George W. Bush makes today to justify domestic spying without warrants and without probable cause. Both Presidents claim that their Constitutional powers as Commander-in-Chief include the right to override any law or statute to preserve and protect the United States. The Bush administration originally argued the war powers given to them by the Congress after September 11, 2001 allow for warrantless domestic surveillance. This was the same argument that was used to justify torture, stripping American and alien detainees of rights and disregarding the Geneva Convention. The Bush Administration has now changed the basis of the argument, claiming it is the Constitution that gives him that power. Nixon lost on the exact same issue that Bush presents. How, then, does Bush, Alberto Gonzales, the Attorney General (and his predecessor John Ashcroft) argue they have the right to do it? In the Nixon case, called United States v. United States District Court, arose the government claimed there were 1,562 bombing incidents in the United States from January 1, 1971 to July 1, 1971, most of which involved government-related facilities and that it needed the searches to combat sabotage and domestic terror. They said there were 597 surveillances, each surveillance may have involved intercepts of hundreds of different conversations, of which 45% were incriminating. The Nixon administration argues, as does the Bush administration, that the "seriousness and magnitude, threats and acts of sabotage against the government exist in sufficient number to justify [these] powers." 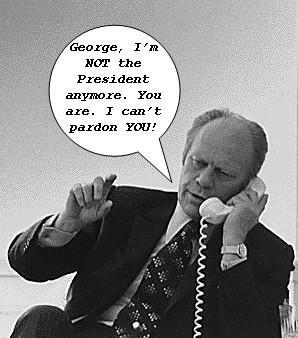 Nixon claimed, as does Bush, that he has to move so quickly, so he cannot go to the federal courts. In both the Nixon and Bush surveillance programs, the President directed the Attorney General to conduct the program based on opinions rendered by their Attorneys General. Mr. Justice Lewis Powell, writing the opinion for a unanimous Court in the Nixon case, said domestic spying does not exist at the whim of the President, and that the government's claimed power to surveillance loses to the rights of "individual privacy and free expression." The vote was 8-0, Justice Rehnquist abstaining. Powell noted that for more than a quarter of a century previous Presidents, including President Franklin D. Roosevelt and Harry Truman authorized domestic spying without probable cause and without warrants. But, said Powell, the Fourth Amendment, which shields private speech from unreasonable surveillance, requires prior judicial approval for domestic spying. Why, then, is Bush pursuing this path? Bush already has the ability to spy on domestic opponents. The Pentagon presently has in the United States a secret Court created in 1978 by the Foreign Intelligence Services Act (FISA). It is not surprising that very few people know of its existence. The courtroom is in a vault-like chamber, a windowless room on the top floor of the Department of Justice. There are seven rotating judges. The Court meets in secret, with no published opinions or public records. Nearly all of those spied upon never knew they were under surveillance. No one, except the FISA judge involved and the John Ashcroft Department of Justice knows what is done. No one, except the government and FISA judge knows who the warrants are aimed at. There is no review by anyone, neither the regular federal Appellate Courts or the Congress of its decisions. Over 15,000 search warrants, permitting eavesdropping, surveillance and break-ins have been sought by the government. Although the FISA court is required to determine if there are enough facts to justify a warrant, only eight times has it ever denied a warrant sought by the government who spied on Americans had FISA. The FISA statute specifically gives the FISA Court the exclusive right to issue domestic spying warrants. There are more warrants issued by the FISA Court than by the over 1,000 district judges who sit throughout the United States in the Federal system. No previous President had the FISA statute. But even this is not enough for the Bush Administration. What is really happening is the Bush Administration is seeking this moment to reverse the Nixon case. The Supreme Court that decided the Nixon case had Justices Douglas, Brennan, Marshall, Stewart and Powell. The Court that hears the Bush challenge will have Roberts, Scalia, Thomas, Alito and Kennedy, all of whom have shown in their previous cases great deference to the expansion of Presidential powers. The President has already admitted on spying on charities, professors, Quakers and libraries. He has declared dissenters to be traitors; he could say the President has the right to spy on all Muslims, the Ku Klux Klan or civil rights activist because they are a clear and present danger to the government's existence. I fear, because of the Court change, Bush will win although Nixon lost.